I’m in a hurry when I enter the flower shop. I expect to find just the plants I’m looking for, pay for them quickly and get out. Flowers from the garden won’t kick in until March when the first of the daffodils begin to bloom. Between now and those first daffodils I must depend on the florist to decorate my home with flowers – and I love decorating my home with flowers. 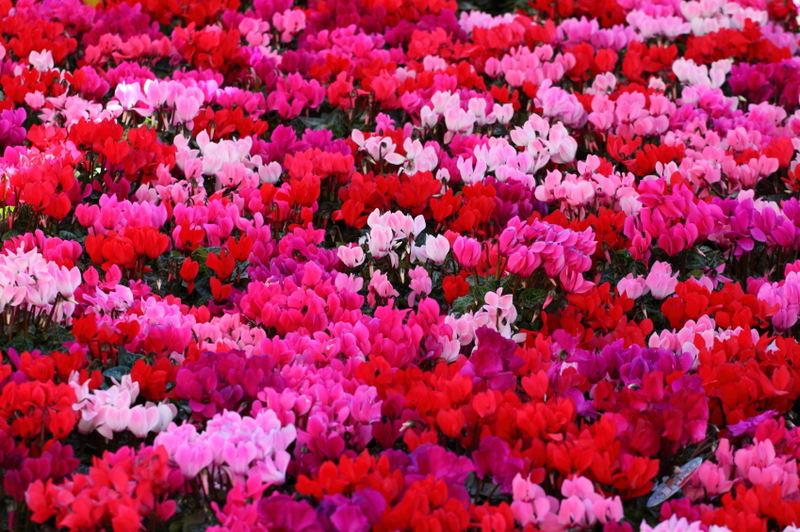 For me, this is the cyclamen time of year. 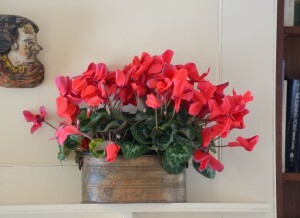 During these winter months, there’s nothing I love more than deep red, or coral or delicate pink cyclamen. They remind me of my garden in California when only the cyclamen bloomed during those winter months, with their graceful turned back petals and lush green foliage. Those bright blossoms seemed like a miracle, a promise of Spring to come. I look quickly around the shop, but all that I find are a couple of white cyclamen and an ugly purple one – definitely the wrong color! Besides, they’re hopelessly small and spindly. Before I can stop her, my Evil Twin Sister bursts forth with a vengeance. “Are those the only cyclamens you have?” she demands, her disdain so thick you could choke on it. I hate it when my Evil Twin Sister shows up. I get all huffy and entitled and imperious. I spray my anger and upset all over the people around me. It’s not a pretty sight and I feel just awful when it’s over. My Evil Twin Sister used to be a constant companion. I was so accustomed to her that I never questioned her presence. Through these many years of work, I’ve come to know that it doesn’t have to be that way. I always have a choice. I’ve become less reactive. What a relief! Now that she shows up so rarely, I’m much more aware of the suffering she creates. I feel the pain of agitation in my mind, tightness in my gut and tension throughout my body. I’m appalled – even as I’m doing it – at how rudely I treat people who have done nothing to purposely hurt me. Afterward I burn with embarrassment, knowing that these people have seen me at my naked ugliest. I know all this and still, at moments like this, she’s hard to control. I’m sick of my Evil Twin Sister. I’d like to be done with her once and for all, though I know that old habits die hard. That night before I go to bed, I ask my Inner Wisdom for help. Flexibility is the ability to see clearly from a point of stillness, to recognize the true situation – what really is – and to act accordingly. Flexibility is the opposite of rigidity. Rigidity is to have a set of expectations about how things are going to be and to enter a situation insisting that reality conform to those expectations. Of course, the florist will have exactly what I am looking for and I’ll get out of there in record time! When reality gives us what we are looking for, there’s no problem. When reality fails to conform to our expectations, if we are in rigidity we insist that reality must behave the way we want it to. Of course, reality is what it is. It’s highly unlikely to become other than it is just to please us. When we cling rigidly to our demand that reality behave the way we want it to, we set ourselves up for the pain of anger and upset which can lead to acting in ways we will later regret. The cure for rigidity is flexibility. At any moment we have a choice. Step back, recognize what is and react accordingly, or insist that things be different than they are and suffer. This seems obvious and clear when Inner Wisdom puts it that way. It’s just hard to remember when the cyclamens are not what I wanted. As soon as we feel that anger and upset arising, we can notice how bad it feels and remind ourselves that we have a choice. Taking a deep breath can go a long way toward helping us calm down. Really feeling a connection with the Earth through the soles of our feet, we can ground ourselves in the reality of what is – ‘just so’, neither good nor bad – regardless of how we may want things to be. Then we can choose wisely. Be kind to ourselves. If we start beating ourselves up – “I can’t believe you did that again! You idiot! Will you never learn?! ?” – we can remind ourselves that we don’t deserve to be treated so cruelly, even by ourselves. Bought the cyclamens that were not exactly what I wanted as a stop gap measure until I found others that pleased me more. Politely left the shop without buying anything and just gone flowerless for a few days until I found what I wanted. Go back to the people we’ve abused, acknowledge what we’ve done and apologize, perhaps even laugh about it. After writing this article I thought I’d give apology a try. When I returned to the shop to apologize for my dreadful behavior, the sales ladies very kindly claimed they had no recollection of my acting badly. One of them insisted that she could not imagine me doing such a thing. I had to agree.